Paper: Beige colored velvet cloth scroll card, box and mailing box envelop on offset printed silk texture on buff card sheet (300gsm), with plastic bars & golden ends and matching tassel. Description: It’s the most stylized form of the traditional scroll in the shape of a Christian/modern scroll card. 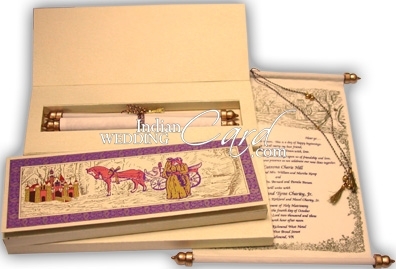 The box front shows a traditional paisley design border frame in gold over a purple base. The image window shows a very scenic multicolored image of a old English castle and golden trees in the background, taking the primary focus is the image of the bride and the groom by a horse cart. The cloth scroll has the same composition in golden printing with floral borders. The mailing box pattern envelope is plain. Please note that we have received the wedding cards. The cards are excellent. I was not aware that the customs duty had to be paid on top of the cost price, I though it was already included. Nevertheless, Thank you very much! We have received the 1st parcel of envelopes and the 2nd parcel cards and accompanying items. The cards are lovely. They came out amazing and I am sure our guests will appreciate their beauty. Hi there. I have received the cards and im very pleased with the outcome. You guys did a great job and got the cards printed and delivered in a very short amount of time. thanks again and good luck with future orders. I am beyond happy right now. I just checked the UPS status of my order and the cards are scheduled to arrive later this evening. TWO days! and thats all it took for them to get here. You have won me over all over once again! I will always order from you and that is a promise! :) I wish you and your company much success from the bottom of my heart! THANK YOU AGAIN!!!!!!! !